Shopping for women’s underwear in-store can be an uncomfortable experience, especially for non-traditional customers, so many prefer to shop online. However, true satisfaction with an underwear purchase comes from fit, feel, quality and comfort all of which can be best ascertained during an in-store shopping experience. 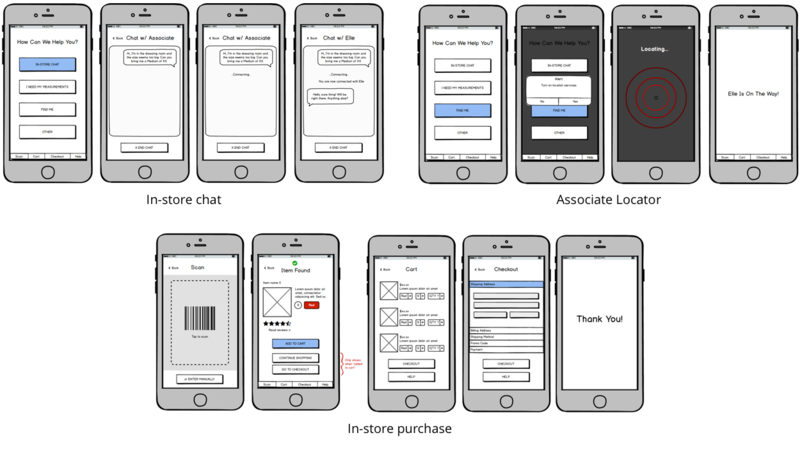 Bravos is a mobile application which leverages the advantages of online shopping and brings it into the in-store experience to mitigate the discomfort and creates an inclusive experience for traditional and non-traditional customers alike. 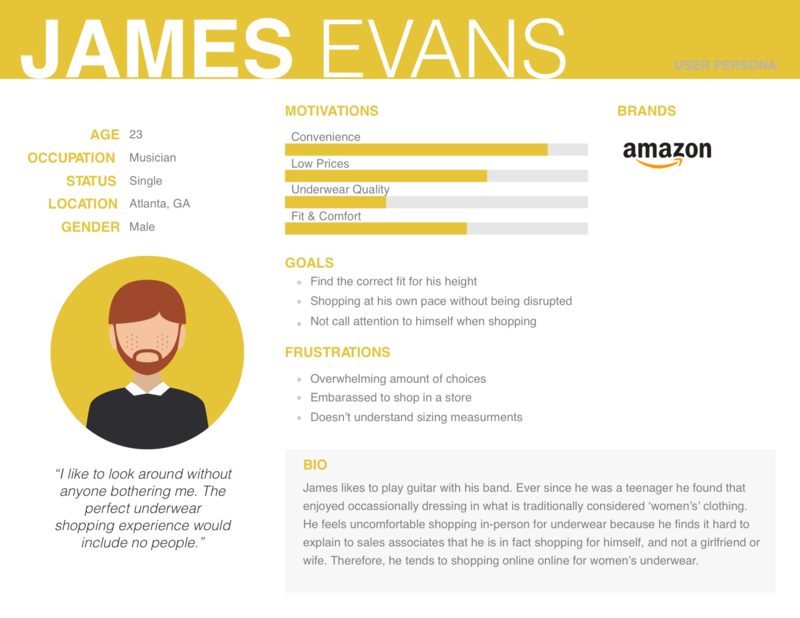 Users can scan a product's barcode to get more information and read reviews by other customers. Users can request different sized products from inside the fitting room using the app. tap. By focusing on them we believed to will have access to a larger target market and potential to make a bigger impact. 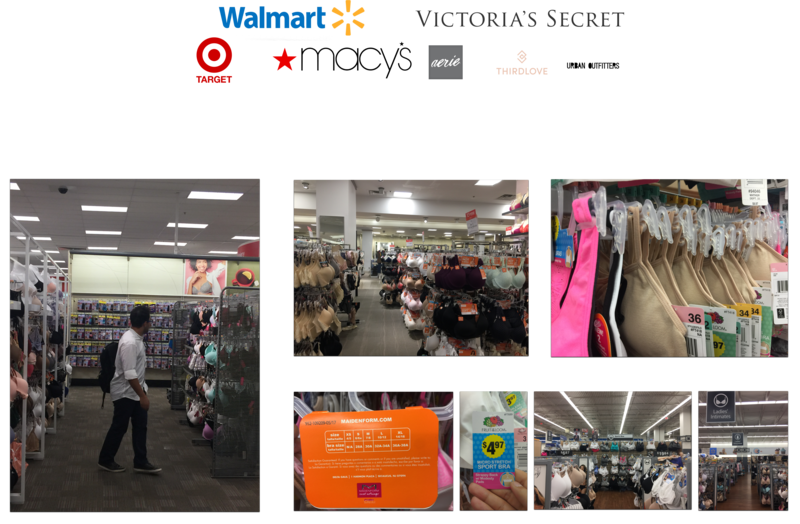 Contextual Inquiry : We conducted three contextual inquiries to gain a more in-depth understanding of underwear shopping experience with Victoria’s Secret both in-store and online. Two of the contextual inquiries were conducted at two separate physical locations in Atlanta. The third contextual inquiry was conducted over a video call for the online experience. Interviews : We conducted interviews total 4 interviews; 2 transgender women who mostly purchased underwear for themselves, one cis woman and one cis-male, who purchases underwear for his partner. Who is the target user ? 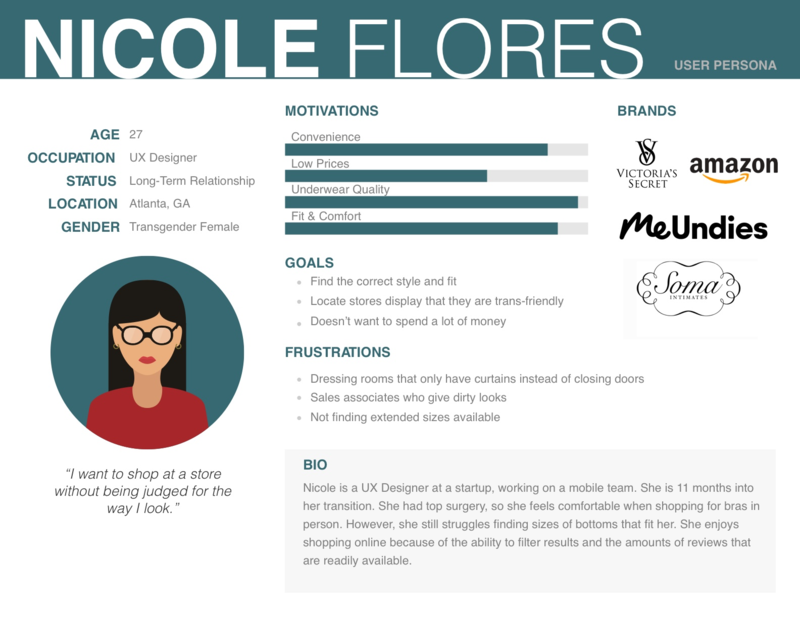 Based on the previous research, we created these user personas so to make sure that we always have an answer to who are we really designing for! In a group session, we analyzed our notes from all the previous formative research on an affinity diagram. This helped us categorize our notes to identify key user needs. Considering the user needs, we brainstormed and came up with 4 different over-arching concepts. 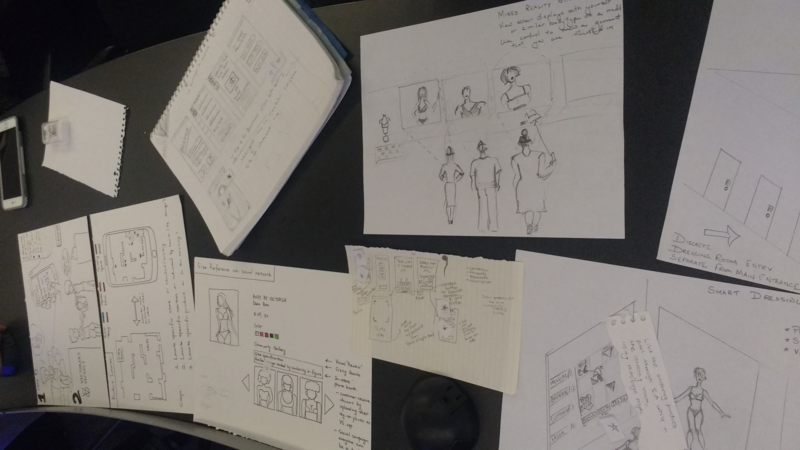 We each sketched and created Lo-Fi designs for one idea each and got feedback on these ideas. As narrowed down our ideas to 4 design concepts, created wireframes in Balsamiq for user feedback. 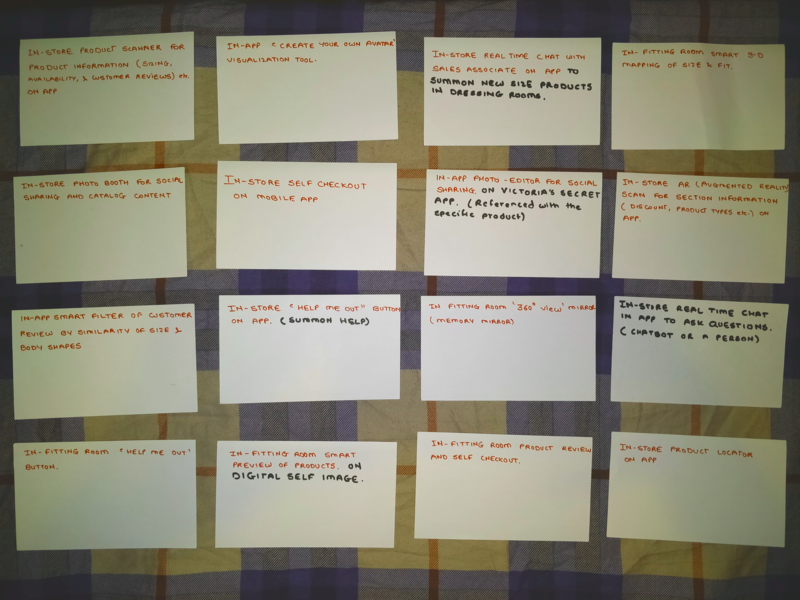 To evaluate the features represented in the four initial concepts, we conducted 3 concept feedback sessions with interviewees from our previous phase of research, as a way to directly examine how our proposed features answer to user requirements. The number of features that received positive feedbacks was more than we could have in a single application as it would increase the complexity of the system and could potentially affect the usability of the app. 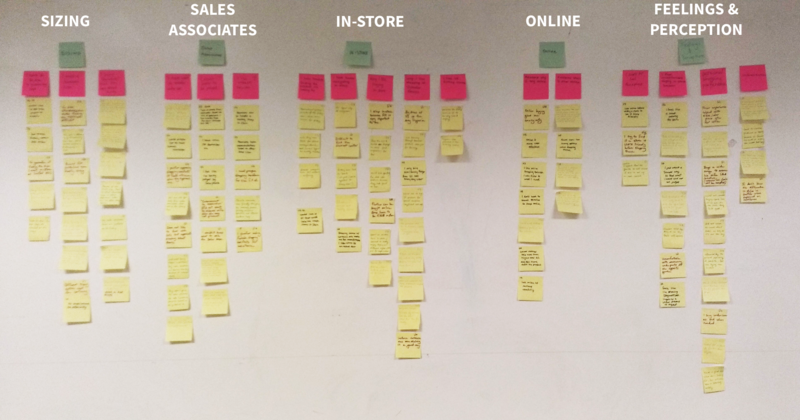 To make an informed decision on which features to keep in the wireframe, we conducted a card sorting activity. 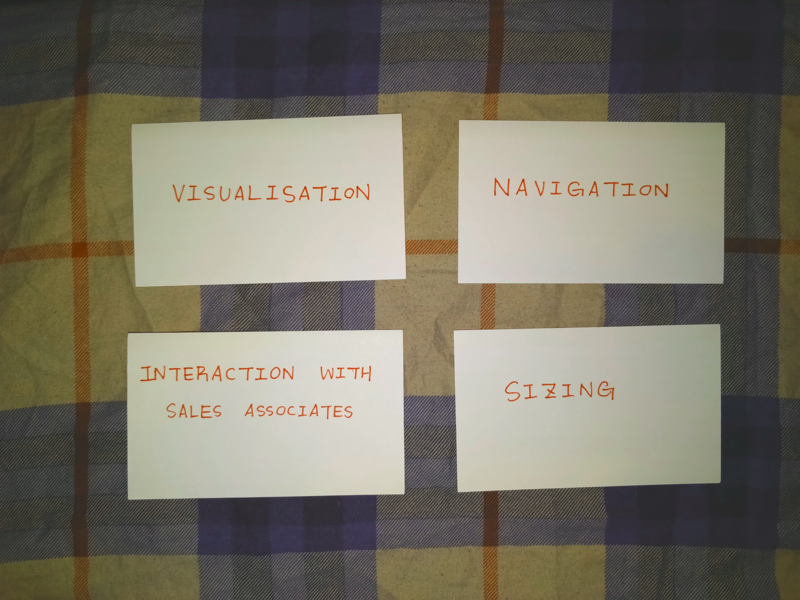 After the card sorting session, we narrowed down the scope of our application to these 4 major features. 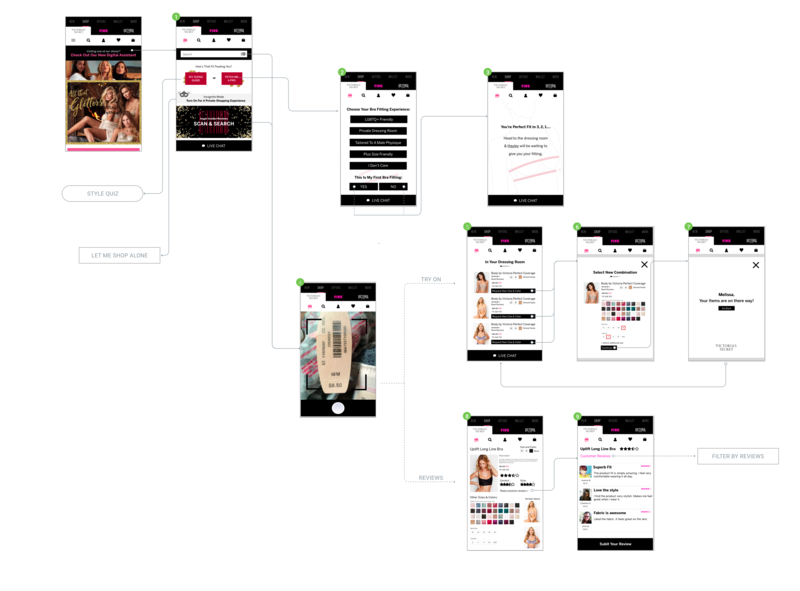 I created a quick wireframe in sketch to get feedback on our mobile app with the features we decided from the card sorting activity. We conducted 4 feedback sessions which comprised of two cis female participants, one crossdresser male participant and one cis male participant. Based on their feedback, I iterated on the design and came up with the final design. The scan and search feature allows users to look up the product information of an item in store by scanning the item’s barcode using their smartphone camera. 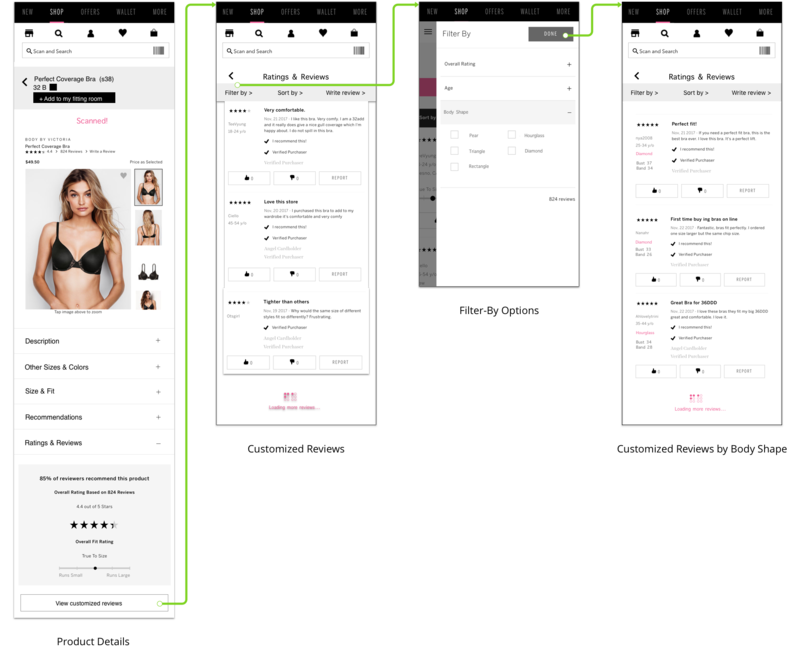 This flow gives users the option to control their own bra-fitting experience by allowing them to choose whether they want to size themselves for a fitting or get help from the Sales Associate. 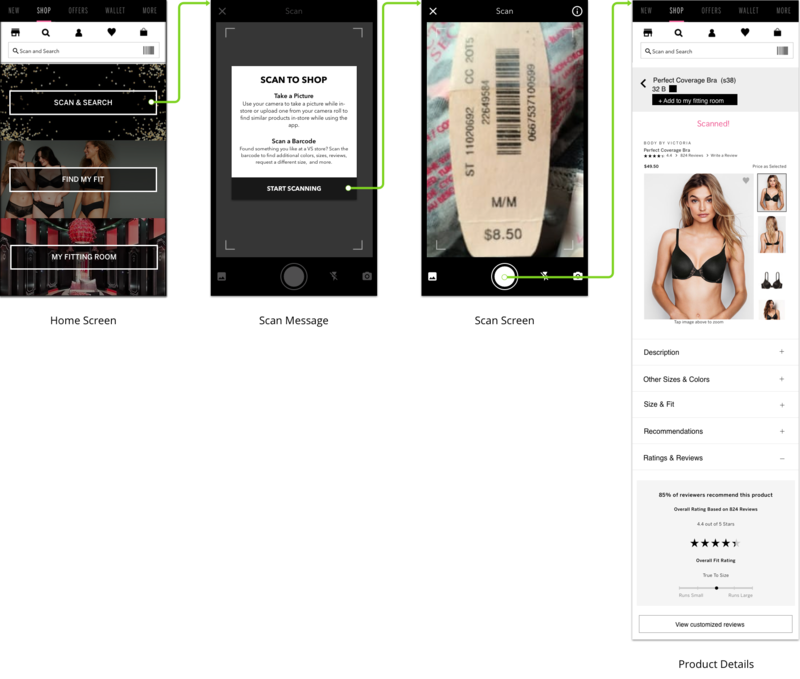 This flow describes how the user can add a product to the fitting room in app, which can then be used to request different sized products from inside the fitting room. 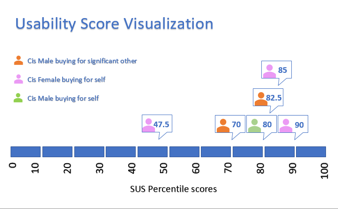 This flow describes how the user can see customized reviews based on their measurements if entered, or by filtering products through different categories. We used a combination of expert and user testing in order to test the performance of our design. 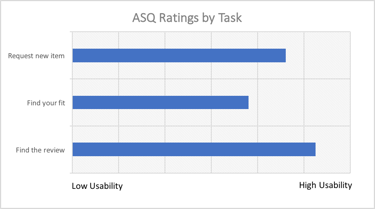 Within these categories we used techniques including Cognitive Walkthroughs, benchmark tasks, the SUS Scale, and After Scenario Questionnaire (ASQ) and Unstructured interviews in order to get different types of feedback. We requested all our participants to follow the Speak Aloud protocol to gather additional qualitiative feedback. This project made me go out of my comfort zone! Personally for me, this project was a great learning experience as this was a problem scope completely out of my comfort zone. I went from a phase from being uncomfortable in a lingerie store, to understanding the pain points for others as well and eventually coming up with a design solution to mitigate those issues. It indeed was a roller-coaster ride. A good part of research involved with reaching out and interacting with people from the LGBTQ community. When dealing with a community who might be going through crises, it is imperative to choose words appropriately. A huge positive impact on our survey was to run the pre-pilot past a couple of friends in the LGBTQ community to cross-verify that we were not offending. I acknowledge that there were various time and resource constraints in this project and the problem we intended to solve is very complicated; but nevertheless we were able to get a positive feedback on our designs and the biggest takeaway was the general response we got from non-traditional customers which was that they were at least willing to visit the stores if such a system existed.